Drawing its name from the classic George Gershwin tune I Got Rhythm, rhythm changes have become one of the most used chord progressions and improvisational forms in jazz throughout its history. Alongside major and minor blues forms, rhythm changes is one of the most often called progressions on jazz jam sessions and gigs. 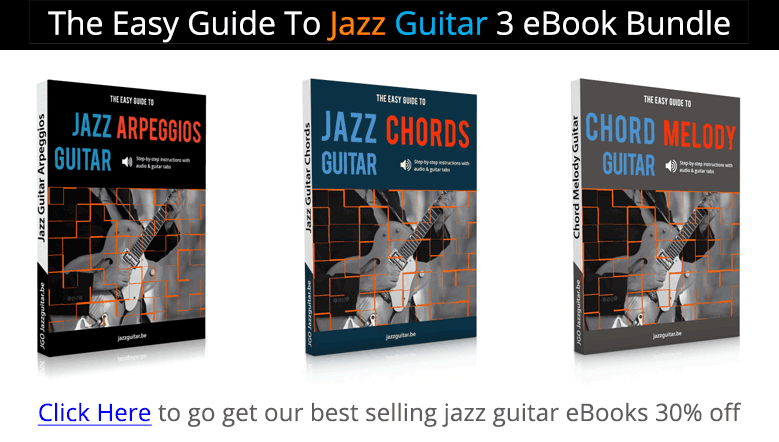 Because of its popularity, having a strong understanding of these chord changes, and being able to comp through them with confidence, are essential skills for any jazz guitarist to possess. This lesson will break down the standard rhythm changes progression, look at a few common variations to these chords, as well as provide a soloing and comping example that you can use for further study. For anyone that has studied or played rhythm changes tunes before, you will know that there are many variations to this common form, just like there are many variations to the jazz blues. 32-bar AABA form (or more specifically A A’ B A’). Begins and ends in the tonic key. Moves to the IV chord in bars 5 and 6. Bridge based on a dominant cycle progression III-VI-II-V. There are many alterations and exceptions to these rules, but a typical rhythm changes tune will contain most if not all of these elements. To get you started, here is a typical rhythm changes lead sheet in Bb with an analysis of the chords. For those of you that have worked on rhythm changes before, grab your guitar and comp through these changes, or solo over them with a backing track, to get going on bringing these chords to the fretboard. If the analysis doesn’t make sense quite yet, not to worry, we’ll be dissecting each of these 8-bar sections further later on in this lesson. To help you get your ears around some classic rhythm changes, here is a list of tunes that you can check out in your listening time in order to prepare your ears for studying these changes later on with your guitar. Now that you have checked out some of your favorite players jamming on rhythm changes, let’s begin to break this common jazz progression apart and apply these changes to the fretboard. Just like the jazz blues progression, you will encounter rhythm changes in various keys. While players and tunes will call for rhythm changes in different keys, by far the most commonly used key to play in is Bb major, which is the key we are focussing on in this lesson. The most commonly used key to play rhythm changes is Bb major. Because it is such a popular key, it’s a good idea to work mostly in the key of Bb major when studying rhythm changes, and from time to time venture off into other keys such as F and C if you feel like adding a new challenge to your practicing. You will explore a number of variations to the A and B section chords in this lesson. How do you know when and where to use these chords? You can use any/all of these variations in your comping and soloing throughout the course of the tune, or you can pick a set of variations you like and stick to them. Each chorus, or even each section, could contain slightly different chords as you explore the various harmonic possibilities of this tune. At the same time, you could pick a set of changes that you enjoy and stick to those, as long as the rest of the band is aware of what you are doing, either by ear or by discussing it with them. All that to say that you can be as rigid or as flexible as you want with these chords when applying them to a practical, musical situation. Having these variations under your fingers and in your ears will allow you to react to what others around you are doing as far as their harmonic choices. To begin our study of the chords used in rhythm changes, we will be taking a look at the A sections of the form, which make up 3/4s of the tunes overall progression. Though you can talk about and think about these changes as all being part of an “A Section,” to differentiate between the first A (which uses a turnaround at the end) and the 2nd and 3rd A’s (which use a cadence at the end), by labelling them as A and A’ so you can see the slight difference in progression and function of these sections. To begin, we’ll be looking at the first A section (bars 1-8), as well as common variations to these changes. The first example in this section outlines fairly standard changes to the first 8 bars of rhythm changes in the key of Bb. The first four bars are stating the tonic key of Bb major. Bars 5 and 6 move into the IV key (Eb major). The last two bars function as a turnaround back to the top of the form. Even when we begin to alter these chords in further examples, those harmonic pillars will remain the same as they are characteristic of A section rhythm changes chords. Now, you can begin to alter these changes by making the vim7 chord (Gm7) a dominant chord: VI7b9 chord (G7b9). Depending on the lead sheet, and your preferences, you might want to play this chord as G7 or as G7b9, and throughout this lesson, you’ll see both written. The next example replaces the Bbmaj7 (Imaj7) in bar 3 with a Dm7 chord (iiim7), to create a iii-VI-ii-V progression in bars 3 and 4. Replacing the tonic chord with a iiim7 chord is a common substitution in any jazz tune, and it’s a great way to add variety between bars 1-2 and bars 3-4 of any rhythm changes tune. You can now replace the Imaj7 chord (Bbmaj7) in bar 5 with an Fm7 chord (iim7 of IVmaj7), to create a ii-V-I progression in that part of the tune. As jazz musicians love ii-V-I changes, this version of the A section is one of the most popular. To finish up our study of the A section, let’s look at the A’ sections: the 2nd and 3rd A sections in any 32-bar form. You can use any of the same variations that you saw over the A section in the previous examples over any A’ section, the only difference is that the last two bars of the 2nd and 3rd A sections are a ii-V-I back to the tonic chord (Bbmaj7). So you don’t have to do much study on these chords, except to work on moving from the Ebm7 chord to the Cm7 chord in bars 6 and 7, which leads you back to the tonic chord in bar 8. Moving on to the bridge section (bars 17-24), you will notice that the harmonic movement is much less busy in this part of the tune, as you have switched from two chords per bar to two whole bars per chord during these 8 measures. In the first example, you will see the most commonly used bridge chords to rhythm changes, using the III7-VI7-II7-V7 progression. You can think of these chords in two ways, one is the III-VI-II-V numerals mentioned already, and the second is that each chord is the V7 of the next chord in the progression, creating a dominant cycle. This might be helpful for your understanding and soloing approach, as you can lead each chord into the next as D7 is the V7 of G7, G7 is the V7 of C7, and C7 is the V7 of F7, which then resolves back to the Bbmaj7 chord at the top of the last A section. Because each chord in the bridge is a dominant 7th chord, the first common variation for these 8 bars is to add a few tritone substitutions to these changes, such as exchanging G7 for Db7 and F7 for B7 as you can see in the following example. You can also add tritone subs to the first and third chords of this section by exchanging Ab7 for D7, and Gb7 for C7. The last group of tritone subs that we’ll look at involves playing a tritone sub over every chord in the bridge section, which can be a tense but cool way to build energy during the B section. Because each chord in the Bridge is a dominant 7th chord, you can also add in a iim7 chord before any chord in this section, creating a series of ii-Vs.
Notice that the original changes are all in bars 2, 4, 6 and 8, while their related iim7 chords all fall in bars 1, 3, 5 and 7 of the bridge section. To finish up our study of the B section, here is a fun set of changes that come from the tune “Eternal Triangle,” which as you can see are much different than what you’ve seen so far. Because these chords, which are a series of descending ii-Vs moving down in half-steps, are highly chromatic and outside the usual bridge changes, you would want to make sure the rest of the group knew you were going to play these changes before using them in your playing. Though they are very different, these chords are great to use when you want to spice up the bridge section, especially during the solos or on a tune like “Oleo” where the bridge of the melody is simply improvised, as they add a bit of surprise and a challenge to both listener and performer. Now that you have learned about the construction of rhythm changes, let’s take a look at a comping study that you can use to practice this common form in your studies, and expand your chord vocabulary at the same time. The study is written to outline all four sections of the tune, and so feel free to break this study down into 4 or 8 bar sections at first in order to make it easier to learn. Also, going slow and working with a metronome will allow you to get the most out of this study, as the rhythms used in the chorus are just as beneficial to digest as the chords themselves. In this chord study, you will learn how to apply different chord concepts to the rhythm changes form, as well as study a chord etude written over a Bb rhythm changes that utilizes these concepts in its construction. 6th Chords – When playing over maj7 chords, you can play the relative minor chord to create a 6th sound over that change. You can see this in the study where you play Gm7 over Bbmaj7 to create a Bb6 sound. Dim7 – If you see a 7b9 chord in any tune you are playing, you can play a dim7 chord from the b9, 3, 5 or b7 interval of that chord, such as playing Abdim7, Bdim7, Ddim7 or Fdim7 chord over G7b9 in this study. Drop 2 – Drop 2 chords are built with the interval structure 1-5-7-3 with the inversions worked out from that root-position shape. 7alt – In this instance, 7alt chords are being built by playing a maj7#11 chord from the 3rd of the underlying shape, such as playing Bmaj7#11 over G7 to create a G7#9b13 sound. 3 to 9 – These rootless shapes are built by playing the 3rd, 5th, 7th, and 9th of the chord you are on, essentially replacing the root with the 9th of any shape you are playing to create this new sound. 13th Chords – 13th chords are built in several different ways, but one of the most commonly used is to replace the 5th of the chord with the 13th, which is a tone higher than that interval in any 7th chord shape. 4th Chords – Quartal chords are built by stacking 4th intervals, as opposed to the traditional 3rd intervals, these shapes have a more modern sound to them as compared to drop 2 or other commonly used chord shapes. Lydian Sub – In this chord approach, you are playing a maj7#11 from the b7 note of a 7th chord, basically playing the Lydian chord from that key over the V7 chord in the changes. This creates a V13 sound when applied to a dominant 7th chord in a comping situation. 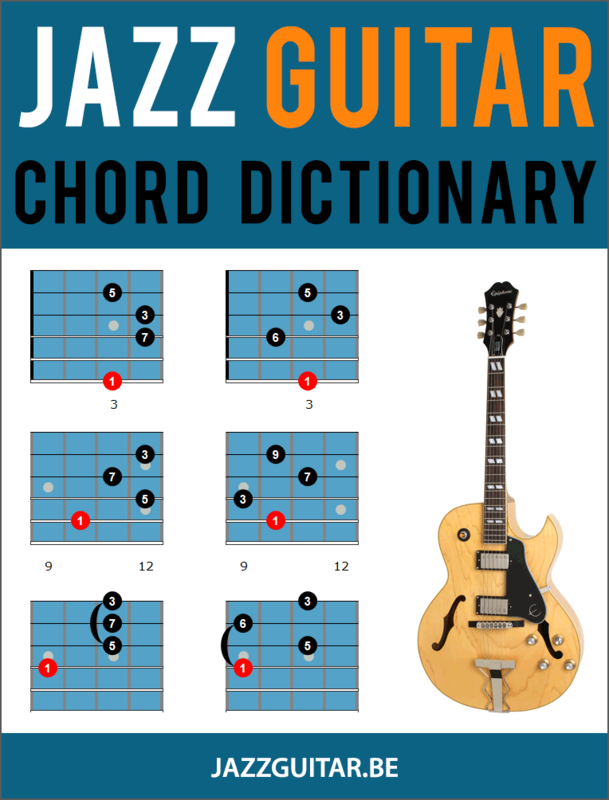 Here is the full chord study that you can work on and take to the fretboard in your jazz guitar practice routine. To finish up our introduction to rhythm changes, here is a one-chorus soloing study that you can learn in order to get an idea of how to solo over these chord changes. As this is an educational study, I’ve used a number of classic rhythm changes licks and patterns throughout the solo to help you build your vocabulary. Because of this, feel free to extract any small phrase, even pulling out 2 or 4-beat phrases, and study them further. I can’t get most of this theory, but I love playing what’s written. Thanks. The D7 & C7 are in fact F#m7b5 and Em7b5? I see them as rootless 9th chords. I first ran across them from bluesmen like T-Bone Walker. That’s it. If you play a m7b5 chord starting on the 3rd of any 7th chord then you get a rootless 9th version of that same chord. First, thanks. I love this site and lessons. Second, I always thought the the rhythm changes went from a B flat to a Gm not G7flat9 or G7. Can someone help me understand the substitution here. Much appreciated. Me too. I used to play Gm but now seeing mainly G7. The G7 is a VI7b9 chord, or a V7 of iim7 chord. So it leads nicely to the Cm7 chord, iim7, in this tune. That’s why you’ll see guys using it instead of Gm7. I may may have to change my name to The Incrementalist.I am fresh out of the Duke Ellington school of “if it sounds good play it”To know what to do is the affection.But to understand why when where and share is the love.Teaching anything of value is supreme.Matt.Dirk and those i do not know Heres to you and THANKS. What’s the function of the Ab7#11 and what’s its relation to the cmin7? Hey, the Ab7#11 has two functions, it’s a bVII7 in Bb and the IV7 in Eb. So it’s a transition chord of sorts between the two keys. What a nice comping study you’ve posted here! In the first bar of the last 4 bars there is a chord movement with 3 chords to which – again – I’m not able to put a name – the first one I didn’t get to run across so far, the second one, its shape looks familiar to me – but yet its name eludes me. And in Bar 14, is the second chord (4536) really Ab7#11 or is it for the harmony underneath (if I may say so)? A great many thanks for your LIGHTS! If your time permits. Thanks. In the last four bars, the first chord is an Fm9 chord, but it’s a 3 to 9 shape. So it’s an Abmaj7 being used to sound an Fm9 chord. And in bar 14 it’s an Ab9#11. Cheers! I’d love to take courses with you!! Hard work for me but worth it. Again, thank you. Hi! When comping in A section You can add on top of syncopated chords a head as counterpoint…Happy comping! Great lesson I really like the audio that comes with the sheets. Rythm changes.What a lesson!Thanks for demystifying substitution(in the bridge part specifically) in such an elaborate & crystal clear manner.Actually the same can be said of each & every lesson on this site.Good work.Keep it up. What i don’t understand . You are using some chord or chord names in the Rhythm chord studies who aren’t correct as far as i know chords. Your F7 shown in Tabs is an EbMaj7 and some others. For me its the question what did you mean? The chord as named or the chord in the Tab? I know from Guitar Tab pro that sometimes the program don’t change notes when renaming or changing chords… Nevertheless its a very good lesson. Hey, thanks for checking out the lesson. Those are the correct chords. The root note defines the chord, not the shape. Often one shape can be many chords. Like Ebmaj7#11 can be Ebmaj7#11, F13, B7alt, etc. That’s what’s going on there. Matt — this really is a great lesson! The piano player I play with loves a variation of this tune, so I figure I’d better learn it, and found this. The final chart is very very cool — it gives examples of some great rhythm comping, like that little sneaky rest in bar 7, giving it a sophisticated feel, and a few chords I definitely didn’t know. Thanks for putting this together — your lessons are a gold mine to one trying to develop a jazz guitar approach. Thanks for such wonderful lesson, and for sharing and your work. Learning a lot with it.